Vincent Pastore ... Vinnie "D"
I popped this into the VHS player this morning not expecting much, what I got was a solid drama filmed in my hometown of Brooklyn that paid off on a smaller scale. 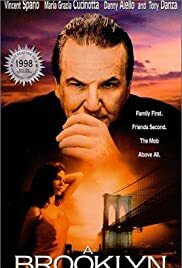 Danny Aiello plays an Italian Mafia man and does a great job turning in a performance as a real son-of-a b-tch that deserves what is coming to him. We also get a nice lead turn by Brooklyn native and handsome actor Vincent Spano not to mention the very easy on the eyes Italian Beauty (from the old country) Maria Grazia Cucinotta. Tony Danza has a good supporting role. Not a great all time classic but the film delivers and is well worth the view. Fans of Scorcese, the Godfather films and the Sopranos would not be disappointed.